Many (count me as one of those) seemed to think this blog was dead, but, alas, we were all wrong and here I am, back for my now customary -it seems- biannual update. There have been some other works waiting the line in the last two years, but, since they’re late already, I thought it might be worth sharing something hot off the presses. 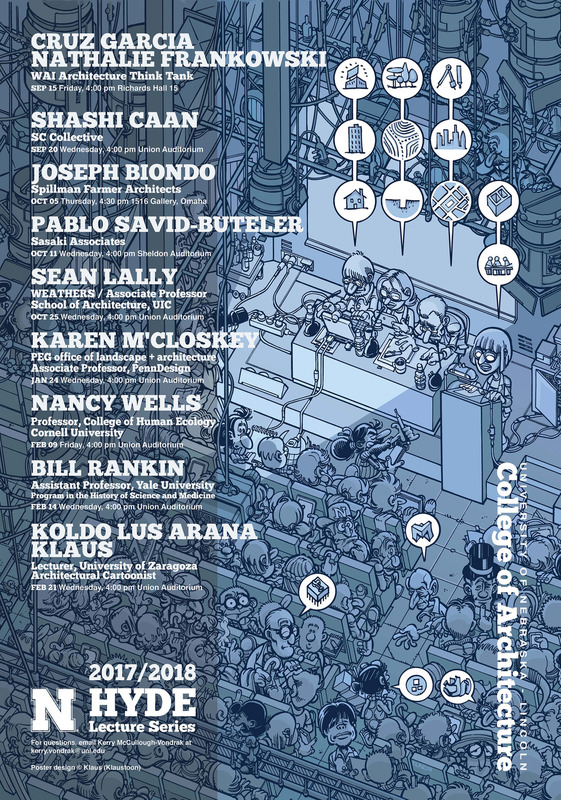 A little backstory for this one: A few months ago, Sarah and David Karle, from the University of Nebraska Lincoln contacted me, asking if I’d join this year’s Hyde Lecture Series, a question whose answer is, by default, ‘Yes, of course’. They also asked if I would like to design this year’s poster. Unfortunately, I’ve been swamped by work this term, and I would hardly be able to fit it in my schedule. So I said the only thing I could: ‘Sure, I’ll do it!’. Of course, since I was in a very tight schedule, I decided to make the drawing as complicated as possible. I’m not sure this is the most crowded cartoon I’ve produced so far, but it’s certainly up there in the Top Ten. Thanks, guys, I’ll see you in February! Bonus peek #1: I rarely (as in ‘never’) produce preliminary mock-ups for my drawings, just some random sketches. But they asked, so as to get an idea of what they would be getting, and in this case I thought it was more than fair. It was also very useful, because the poster needed to be bigger than my usual drawing size, so making sure it worked in advance took some anxiety away. In fact, I later blew it up and drew the pencils on top of it, which made the process of adding the details a pretty zen experience. 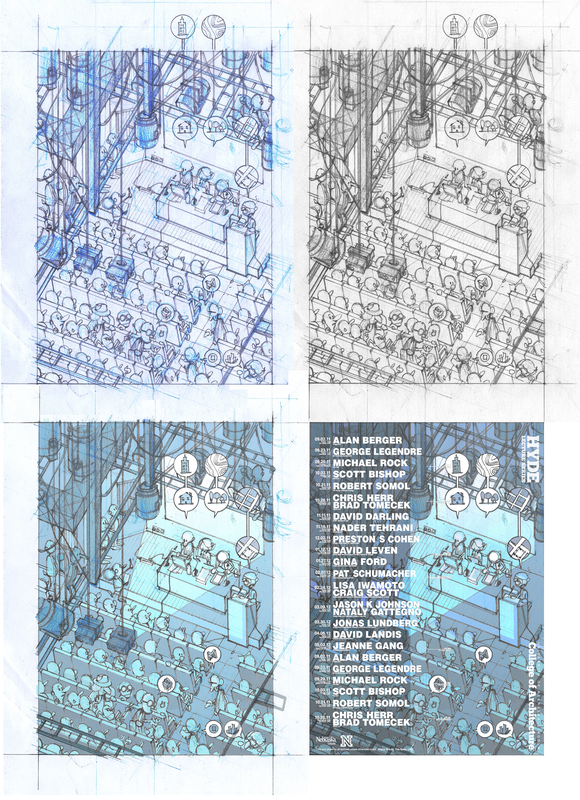 Bonus peek #2: The final drawing for the poster, from pencils, to inks, to colors. See if you can spot all the referents (no Trump, sorry).